Type: BOOKS. Detail: Soloviov, S. Product Code: 9548782405. Category: PLAYERSA. Publisher: Chess Stars. 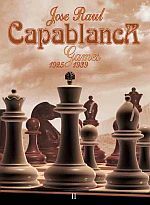 Concluding part of the 2 volume set covering the games of Capablanca. Many of the games annotations have been revised and/or enhanced, as well as 61 new exhibition games have been included. This book contains practically every game of Capablanca's from the period 1925 to 1939. Contains 256 extensively annotated (languageless) games with at least one diagram per game and tournament crosstables where applicable. Sorted chronologically into over 20 chapters the book also indexes Capablanca's games by opponent and opening. Fischer World Champion! (3rd Editio. Euwe & Tim. $49.95. Leko's One Hundred Wins. Soloviov, . $19.95.